If you are a fan of golf, you may already know that this year marks the 42nd Ryder Cup. The event is going to be played on the L’Albatros course at the Le Golf National located in Saint-Quentin-en-Yvelines, France. Dates for the event start on Friday, September 28th, and finish on Sunday, September 30th. Don’t miss a moment of the action as your favorite team competes for their chance to win the cup. Enjoy the Ryder cup from anywhere in the world with a fast, reliable VPN service. You will want to select a VPN server location based on the broadcast network. Here are some options for streaming the Ryder Cup matches live. The Ryder Cup is a bi-annual men’s golf tournament that is played between the United States and Europe, in alternating locations. It is named for English businessman Samuel Ryder, who donated the original cup. The tournament was first suggested by the Golf Illustrated magazine in 1920. At that time, no American had ever won the British Open. Since the tournament was held 2 weeks before the British Open, the hope was it would provide a bit of a warm-up. The PGA of America agreed. The first Ryder Cup was played in 1921 at the same golf club that is being used in 2014. Despite its founding year, the Ryder Cup did not become a well-organized event until 1927. Over time, many changes have been made to the Ryder Cup tournament. Some of these changes include the tournaments bi-annual status, the moving of the time of year it is played, and in 1977, the inclusion of athletes from continental Europe to make the cup more competitive. The last idea worked well. The Ryder Cup instantly became more competitive. Even after the switch, however, the United States still has double the number of wins. The last time the Ryder Cup was played was 2016. The competition took place at the Hazeltine National Golf Club located in Chaska, Minnesota. In 2016, the Americans were able to take the Ryder Cup after the Europeans won three times in the row. It will be interesting to see if Europeans can take the win for the fourth time in a row. Like a few other Ryder Cup contests, the 2014 version saw it’s own controversy. On the Friday of the tournament, guest commentator Nick Faldo took criticism for making comments about Sergio Garcia. In 2008, Faldo allegedly benched the Spaniard for his bad attitude and called him “useless”. Not surprisingly, many commentators lost some respect for Faldo after the comments that he made. He later said that his comments were just throwaway comments, and there was no malice behind them. Though Woods announced he would not compete in the 2014 version due to back problems, there were plenty of other players to choose from. They certainly did not do much worse than losing on the last putt to lose the Ryder Cup. There were 12 picks available by the non-playing team captain of the USA (Tom Watson), and the non-playing team captain of Europe (Paul McGinley). That number was increased from 10 to 12 in 1969. This course features slick greens, undulating fairways, and a modern links style course feel. Many golfers need to use every club in their bag because of the difficulty of the course. Stay tuned this year to see if Europe will be able to recapture the cup. If you are a fan of the ancient sport of golf, you won’t want to miss the Ryder Cup. We will use ExpressVPN for the example of how to use a VPN service to watch the Ryder Cup. First, you’ll want to download the VPN client. 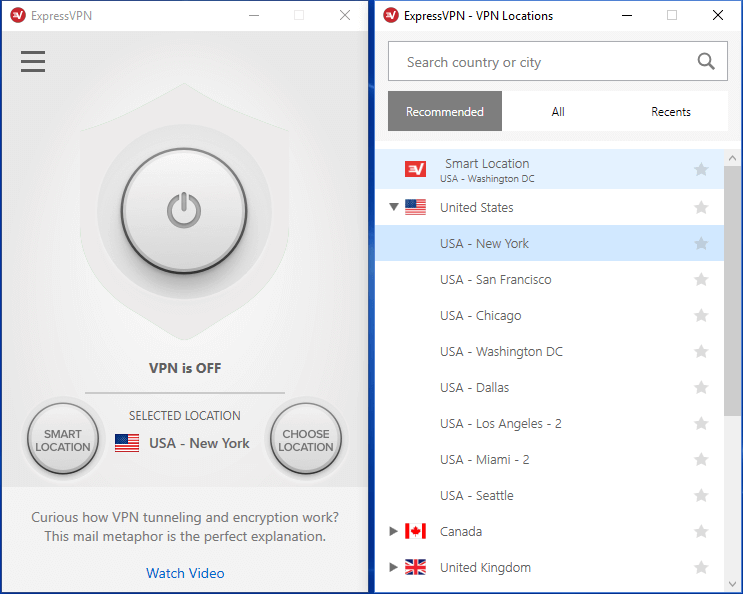 ExpressVPN offers client software for Windows, Mac, and Linux. Mobile users can download apps for iOS and Android. You can even use the ExpressVPN router app to secure every device on your network. It will send all your communications through the VPN which extends support to devices like game consoles and streaming boxes. They even have an app for Amazon Fire TV devices. Now that you’ve had a chance to download and install the software, it’s time to connect. Launch the ExpressVPN client and select a server location. We’ll walk you through step by step using their Windows client. You can also watch on your favorite mobile or streaming device. ExpressVPN has a large network of servers all over the world. Select a country in which you want to watch coverage. Some popular choices include US, UK, and Germany. It is just that easy to do. Now that you have an IP address from an ExpressVPN server in the US, you can browse the Internet or watch the Ryder Cup as if you were actually there. The same is true from any country, so connect to the UK for Sky Sports coverage of events. As you can probably tell by now, a good VPN opens access to content around the world. For use outside of the US, the service can help you unblock popular services like Netflix, Hulu, and Pandora. You still need an account for services like Netflix but the VPN will help you watch American shows and movies on Netflix as if you were physically there or in any other region you would like to access. Enjoy all the excitement during the 2018 Ryder Cup. Please share this post with your friends so they can enjoy all of the action from anywhere in the world with a VPN. Follow us @VPNFan for the latest deals and guides.